I was reminded today, while looking through pictures of similar-age babies posted by Facebook friends of mine, that I should be introducing Michael to a sippy-cup. And suddenly, I wondered just where the time went. I know the answer to that, actually, but feel no less bewildered for it. It's all been sucked up into the all-consuming Season of Reflux in which my family has been living for the past half-year. Looking back now, I could almost make a bad joke of it, even prepare a silly meme (that only Tom and I would understand), using that classic picture of Sean Bean from Game of Thrones that always begins with the phrase, "Brace Yourself." 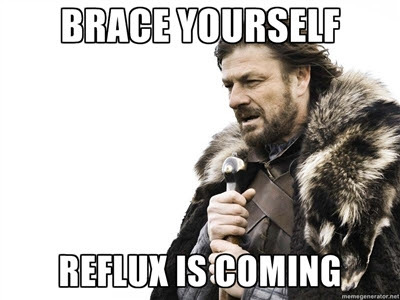 If only we had known, when Michael was first born... Reflux is Coming. And what a trying season it was. Full of tears, pain, discomfort, frustration, helplessness, vomit, and a tragic lack of sleep. A lack of sleep so profound that just weeks after finally starting to pull beyond it, I am fruitlessly losing my grasp of any permanent sense of what I have just gone through. Only ghosts of memories remain; abstract echoes of desperation and despair. Which is as it should be- I am ready to leave all of that behind. Though, I thank God for this blog, in all of the ways that it has helped me to preserve the memory of the good experiences that we managed to have in the midst of our trial, and all of the ways in which both of our children have managed to grow and achieve amazing things throughout it all. However, I am realizing that much was lost, as well. So much of my presence, and attention. So much of my ability to interact, and be involved. And while I grieve for these losses, I must necessarily move on from them as well. It's so easy for me to focus on the negative, to get depressed over the fact that we're nearly seven-and-a-half months in and still not on any kind of solid food introduction schedule. That Michael is still struggling to master the process itself. That he's only had the opportunity to try four fruits and vegetables, one of which (peas) we may need to avoid for awhile, one of which (avocado) I couldn't get him to eat, and two of which (apples and pears) I didn't even make myself. Tom and I were so good with Abby, taking the time to prep and freeze meals for her, establishing mealtimes, altering the size of bottles to balance out the increase in solid foods. Steadily moving forward. And doing so with great joy and excitement. With Michael, I'm still trying to reattain a sense of normalcy, and I can't quite focus enough to start changing things up, just yet. Not that I'm not making changes all of the time, really, which I suppose is a large part of my problem. We're still not set in a bottle-feeding schedule, let alone a solid-feeding one. We're still working on finding a formula that will suit him. He's happy enough with the taste of the soy, but it's backing him up terribly, so Tom and I have decided that we've got to find another solution. 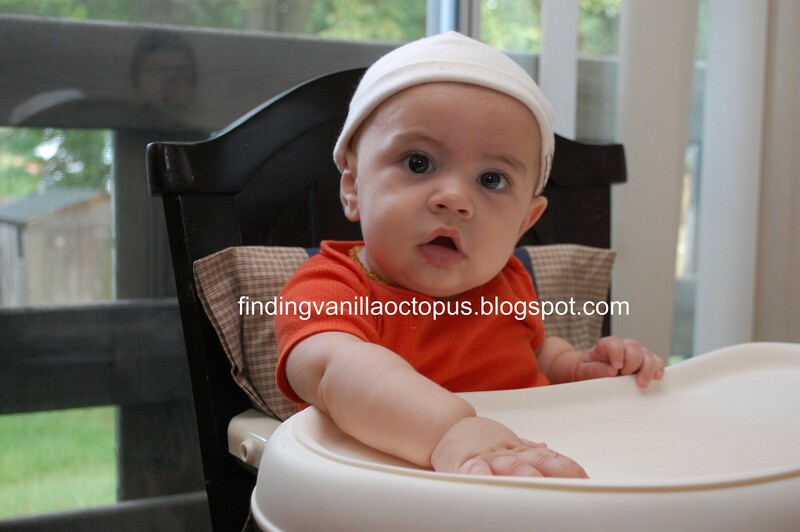 We're trying to switch him over to a dairy-based formula instead. It's not going too terribly, but formula changes of any sort can cause all sorts of issues with babies, and Michael's been suffering his share of discomfort lately. I pray that it passes soon, and we get back to improving upon his sleeping, rather than regressing further, as we did last night. And in the meantime, there are milestones to coax him towards. Like introducing water. In sippy-cups! Such an exciting prospect where Abby was concerned, and it's causing me great axiety now. How ever will I fit it all in? How ever will I keep track of all of the things that I'm supposed to be doing? I don't know. I know that I must keep plugging forward and doing the best that I can. And I hope that Michael and I don't fall too far behind in the process. In the meantime, I am full of awe, wonder, and an infinite sense of gratitude for finally being able to enjoy the beautiful person that was once nearly hidden under so much suffering. My mellow little dude. It breaks my heart that any of us had to endure this. Him, most of all.